Home » Fantastic renovation in SOBO, picture perfect bungalow in Clintonville with new everything! Fantastic renovation in SOBO, picture perfect bungalow in Clintonville with new everything! 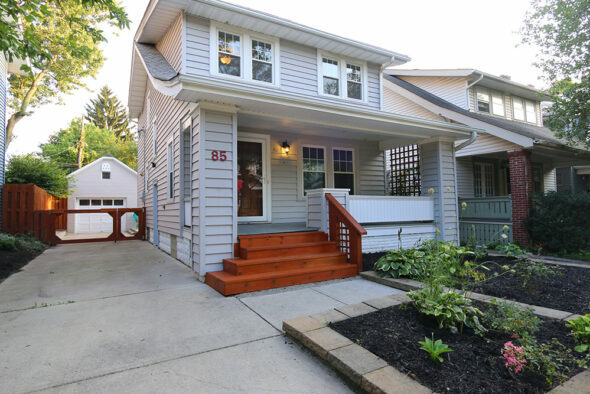 Fantastic renovation in SOBO, picture perfect bungalow in Clintonville with new everything. Large living room welcomes you with large fireplace with gas cast iron stove. Bright sunny kitchen, with new appliances, countertops and flooring. Three nice bedrooms with a renovated bath completes the second floor. One bedroom has an added office or walk-in closet space. Basement has been painted and has a second full bath. Fenced in yard with inviting brick paver patio. One car block garage with storage above if needed. Refinished wood floors, new light fixtures, newer windows, HVAC replaced in 2015 and newer roof.